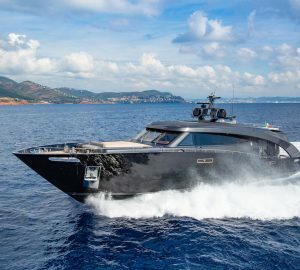 Custom 60ft Luxury Trimaran FREEDOM is an excellent example of a high performance sailing yacht with all of the style and amenities of home. 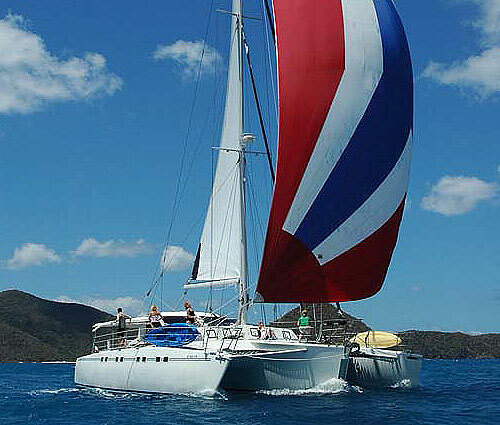 Available for private charter throughout the BVI , Windward and Leeward Islands and Grenadines, FREEDOM is the perfect yacht for charterers wishing to experience all of the adventure and beauty the sunny Caribbean has to offer. 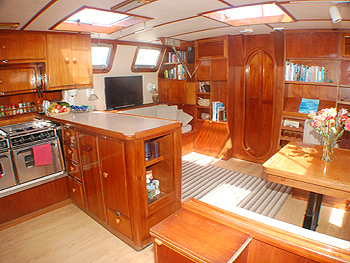 FREEDOM boasts an equally spacious and finely appointed interior finished in classic yachting style with gleaming teak woodwork and full air conditioning. 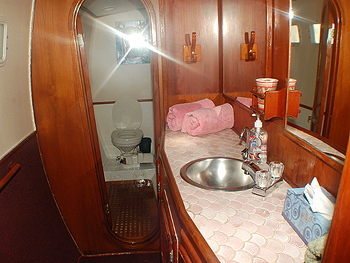 Her comfortable salon seats 10 at the formal dining table, or you can curl up with a book from her onboard library in the plush and cozy reading nook. 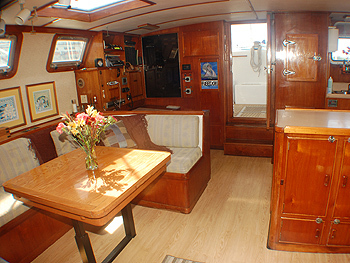 Her open galley invites guests to sample the chef’s gourmet creations, and her golden woodwork and warmly decorated interior welcome you to your home away from home on the water. 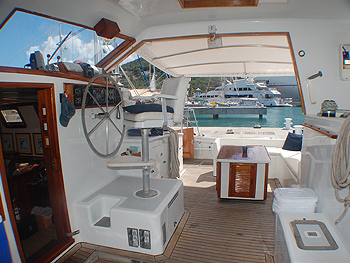 Above decks FREEDOM offers more than 2000 square feet of deck space for your outdoor pleasure. With huge forward trampolines, plenty of space for sunbathing, taking in the view, or even having a shady nap after a day on her toys, FREEDOM offers room for everyone. 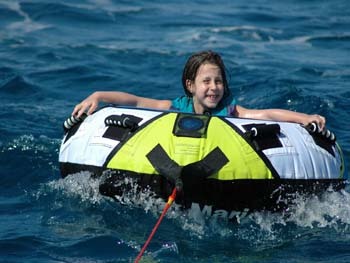 She carries a wide range of water toys including water skis, snorkeling and fishing equipment, floating mats, kayaks, towable toys, even diving gear…all easily accessed from her aft swim platforms. 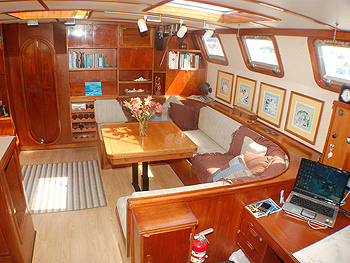 FREEDOM’S fun and professional crew of two are natural hosts, with the gift of making their guests feel right at home and well cared for from the moment they get onboard. 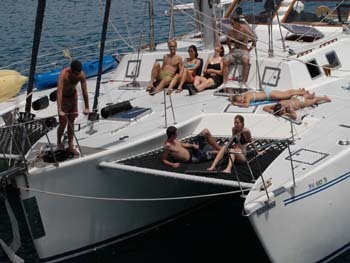 Their easy-going dispositions, combined with attention to every detail, ensure that you will experience an unforgettable holiday of pleasure and pampering with a perfect mix of adventure and relaxation. 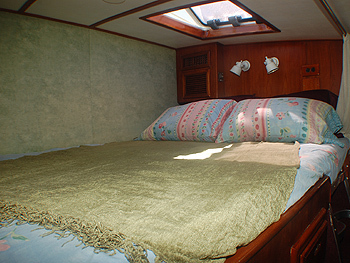 FREEDOM accommodates up to 10 guests in five spacious queen size staterooms, three with private ensuite bathrooms and two with shared bathroom . 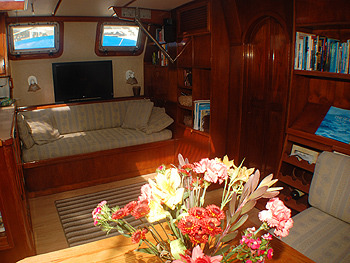 Her gleaming teak woodwork and classic and elegant interior décor warmly embraces guests who will welcome her “home away from home” comforts. 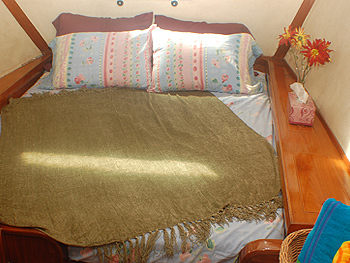 Fully equipped FREEDOM is fully air-conditioned throughout , with onboard water and ice-makers, TV/Stereo entertainment system and CD library, spacious salon with eat-in dining for 10, cozy upholstered reading nook . 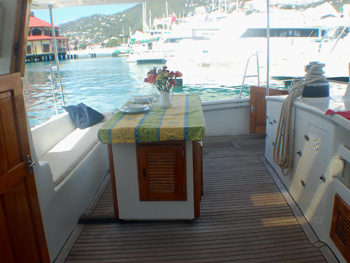 Above-decks she offer a spacious covered cockpit with lounging and dining space, barbecue, deck swing, adjustable sun awning and deck shower. 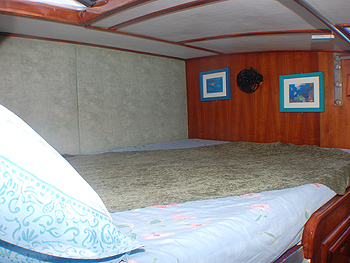 FREEDOM boasts a 8 passenger dinghy with 60 hp outboard and a stunning array of water toys including fishing and snorkeling equipment, water-skis, wakeboard, towing tube, torpedos, scurfer, 2 kayaks and assorted beach games. 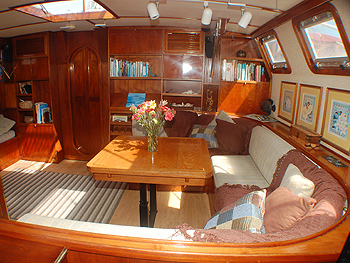 She also carries full scuba equipment for 8 divers onboard, and both Discovery and full diving courses are available on request.